The latest DLC pack has hit the XBOX LIVE Marketplace for Forza Motorsport 3 - The World Class Car Pack. "....We’re back this month with a reason to stay indoors and enjoy the air conditioning; the World Class Car Pack is here and it features a variety of vehicles from all over the world. 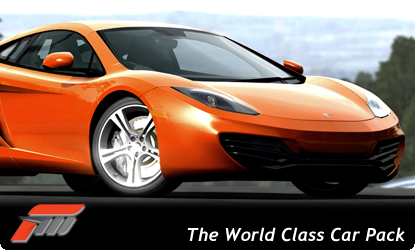 McLaren is back with a vengeance, and we are very happy to have the MP4-12C available as DLC this month. Accompanying the McLaren is a mean pair from Mercedes, the 2010 C63 AMG and the 2010 CL 65 AMG. Fans of hot hatches have reasons to be excited with the arrival of the Fiat Punto Evo SPORT, the Citroen DS3 and the baby Evo, the Mitsubishi Colt Ralliart, make their way into Forza Motorsport. While not capable of record breaking top speeds, these hot hatches are an absolute thrill to take around the track as they dart in and out of turns and into a podium finish. The World Class car pack is available July 13th for 400 Microsoft points. Be sure to click on the thumbnails below to access the vehicle data sheets on each car available in the World Class DLC Pack. Each sheet has in-game photos of the cars and a lot of car specs which should give you a good idea on where you can take these vehicles once you pick up the pack. AVAILABLE JULY 13TH ON THE XBOX LIVE MARKETPLACE...."